Next Saturday, 15th August, will be celebrated for the third consecutive year, the Charity Gala to raise funds for the NGO, World Vision. The event will be taking place place from 20:30h at the Sea Grill restaurant, where you can enjoy live entertainment and a menu designed exclusively for this occasion, in a very exclusive environment. 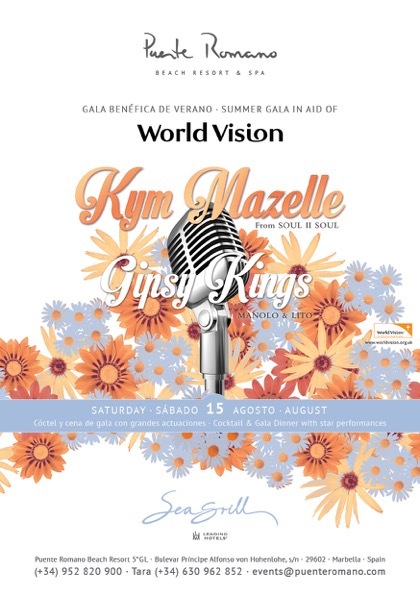 The exquisite dinner will precede the live performances by Kym Mazelle from Soul II Soul, and the Gipsy Kings, who will add the golden clasp to a memorable night for both: the attendees and the children who will be receiving the additional aid. The objective of the Gala is to raise funds to help the most vulnerable children in the world, with the financial contributions that our guests will be donating in this act. The ticket price is €225 per person, which together with the collection from the raffle will add up to the collaboration. The commitment of Puente Romano Beach Resort and Spa has been constant throughout the year, making available to customers a special room rate, i.e., for each extra Euro donated by the client, the hotel provides the same amount to the World Vision.